Review: Happy Days, The Young Vic ✭✭✭✭ | Fourthwall Magazine & The Drama Student – The magazine for careers in the performing arts – actors, drama students, directors, producers, writers, production crew. In Happy Days, Samuel Beckett portrays the existence of a woman when youth is no longer on her side and explores how women cope when faced with despair. Natalie Abrahami’s production at The Young Vic shows Juliet Stevenson in her ’summit’ role as Winnie, the tormented heroine of this harrowing but heartfelt tale of resilience and survival. 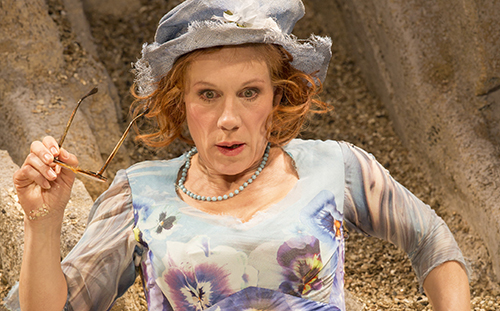 In this demanding role, physically as well as emotionally (she is buried up to her waist in Act One and up to her neck in Act Two) Stevenson has the audience struck into stillness, watching with empathy, as we follow Winnie walk the edge of hysteria as she resolves to cope with her terrifying reality. A compulsive talker, she keeps herself sane with repetition and routine, not to mention by poking fun at herself with a sharp wit, providing the audience with some much-appreciated comic relief. Inspired by Surrealism, Beckett’s image of Winnie, buried up to her waist in a mound of scorched earth, is still a striking and uncomfortable sight to see onstage, and it is not the only aspect that makes this play something that its audience has to work at. With the exception of a few monosyllabic responses from an almost-invisible Willie, the script is a rambling monologue of Winnie’s thought-processes and attempts to keep upbeat in her desperate surroundings, and her never-ending jabber could be exhausting. But, Stevenson triumphs at keeping us onside and we rejoice with her when moments of happiness and satisfaction make brief appearances. Although she would never ask him herself, we wonder why Willie won’t help her, and Winnie’s story of Mr and Mrs Shower walking by and Mr Shower announcing to his wife, ‘I would dig her out with my bare hands’ is, quite frankly, heartbreaking. When Beckett spoke about the play to Brenda Bruce, he was of the opinion that only a woman ‘could cope with that and go down singing’, making Happy Days a testament to women – as well as some resonating theatre with an iconic female lead.